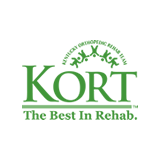 KORT is Kentucky&apos;s premier provider of outpatient physical and occupational therapy specializing in orthopedics, sports and industrial medicine. Since 1987, KORT has provided clinical and customer service excellence to patients in our clinics, at employer sites, and with high school, college, and professional sports teams. Our extended clinic hours offer you the flexibility of before work or after work appointments. With the convenience of same-day or next-day appointments, you can begin your recovery right away. With over 54 clinics throughout Kentuckiana to serve you, you&apos;ll be sure to find one close to your home or office.Clinical excellence, caring, convenience - that&apos;s what you deserve and that&apos;s what you&apos;ll get at The Best in Rehab.